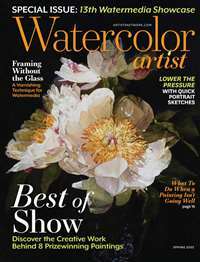 I subscribe to several art magazines and this includes both fine arts & art instruction. I find that the the quartet of Southwest Art, American Art Collector, Art of the West and Southwest Art all complement each other. I have had a subscription to Southwest Art for five plus years and I also give a gift subscription to an artist friend of mind. While the magazine does showcases the 'traditional' western art there is a wide variety of art to enjoy.The 'traditional' western art shown is of high quality and you will never be bored .It amazes me that once you leave the sanctimonious New York art world how many really good artists are out there using paint to create some beautiful and compelling works of art. I like the fact that the publisher ships in a recyclable bag which means that I stand a chance of Southwest Art arriving in good condition. There are special issues each year. February showcases landscapes and there are issues that showcase still-life, figurative, sculpture , contemporary and Native American art. A nice way to group together artists that work in the same field -it helps you to compare and contrast a wide variety of art. I have one problem-I am going to run out of room because I never throw out an issue! This magazine is by far the best for western art. Great articles on artists and techniques. 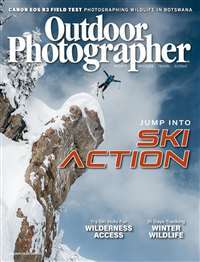 Excellent quality magazine. This was a gift for my mom and she loves the magazine. The pictures are amazing. 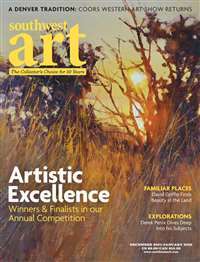 This is a great magazine for budding artists who want to gain a perspective on a variety of styles and subjects. As a gallery owner in central Oregon, it is important to keep abreast of emerging and established talent, trends and events in the western art world. Southwest Art has long been a leading publication in the industry and can be counted upon for timely and interesting coverage of art and artists in the west. SOUTHWEST ART has been around for a long time, a journal that focused on the art of the southwestern regional artists of this country plus a heavy dollop of how-to articles on pastel, watercolor, acrylic, oil etc. It was, and to some extent remains, the chief reference source of cowboy art, Indian art, and the galleries of Santa Fe, Scottsdale, Houston, and environs. But recent issues show an increased awareness of the classical arts and the current issue, subtitled the Collector's Issue, is a strong indication that the magazine is growing in a healthy way. Recent past articles on Drawing included some of our finest artists in the country. Now there are focus articles on particular artists whose works contain no elements of the general past subject matter. For example, the very strong American artist Wes Hempel is featured in this Collector's Issue in a fine article by Devon Jackson entitled 'Personal Mythologies', and while Hempel's works are highly respected and collected from California to New York and in collections in Europe (especially Italy), the writing and generous illustrations in Jackson's article introduce new information that informs this gifted artist's work. And immediately following the article on Hempel is another fine monograph on photographer Keith Carter paying homage to this teacher and practitioner of his craft.